Researchers conduct tests with the Diocles Laser, which is part of the University of Nebraska–Lincoln's Extreme Light Laboratory. The laser is being used to further national defense research aimed at detecting bombs hidden in cargo containers. The University of Nebraska’s National Strategic Research Institute has been renewed with a five-year, $92 million contract with the U.S. Air Force. Announced June 6, the renewal paves the way for a second phase of growth following an initial $84 million contract that launched the institute in 2012. A partnership between the NU system and United States Strategic Command, the institute researches methods to combat weapons of mass destruction and maintain the safety of the United States and its allies. The new contract will expand research opportunities across all four NU campuses, helping meet the needs of U.S. Strategic Command and the Department of Defense. “We are proud to perform critical research in many disciplines that contributes to national defense as part of NSRI,” Chancellor Ronnie Green said. “As one of America’s fastest-growing research universities, we look forward to building on our capacity to collaborate with University of Nebraska colleagues and Department of Defense partners. The institute is the newest of 13 university-affiliated research centers across the United States. Powered by faculty expertise, it focuses on five core areas: nuclear detection and forensics, detection of chemical and biological weapons, passive defense against weapons of mass destruction, consequence management, and other mission-related research. Since its founding, the National Strategic Research Institute has engaged more than 241 NU faculty, researchers and students from a range of disciplines on 84 research projects. “As one of America’s fastest-growing research universities, we look forward to building on our capacity to collaborate with University of Nebraska colleagues and Department of Defense partners." University of Nebraska–Lincoln researchers highlighted in institute projects include: Laurence Rilett, professor of civil engineering; Mario Scalora, director of the University of Nebraska Public Policy Center and professor of psychology; Jeyam Subbiah, professor of biological systems engineering; Benjamin Terry, assistant professor of mechanical and materials engineering; and Donald Umstadter, director of the Extreme Light Laboratory and professor of physics and astronomy. Ongoing work with the Department of Defense to improve a vaccine for the poison ricin. Developing the use of microbubbles to provide a life-saving solution to traumatic lung injuries. The technology, which includes assistance from researchers at the University of Nebraska Medical Center, could allow for treatment of multiple war casualties with minimal equipment and has the potential to be scaled for mass casualty events. Studies into improving the metals used on military vehicles and improving performance in harsh environments and extreme conditions. Advancing laser technology to detect hidden or camouflaged explosives and other materials at a safe distance from the source. Improving the safety and security of military entry points to better protect military and civilian personnel from terrorist events. Hosting an operational law conference that allows attendees to analyze unique legal and national policy limitations on military operations in space, cyber and nuclear warfare. 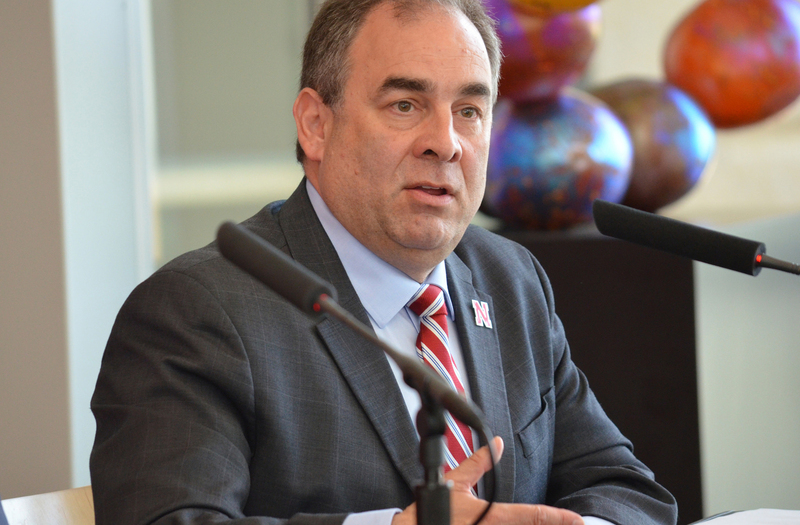 Mario Scalora, director of the University of Nebraska Public Policy Center and professor of psychology, talks during the June 6 announcement that funding for the National Strategic Research Institute has been renewed. “It is clear that the outstanding work our faculty and staff have done through the National Strategic Research Institute to protect our warfighters is just the beginning of what we’re capable of,” said Hank Bounds, NU president. “This contract renewal is a strong signal from the Department of Defense that the University of Nebraska’s efforts are relevant, timely and worthy of continued investment. Learn more about the University of Nebraska’s National Strategic Research Institute.